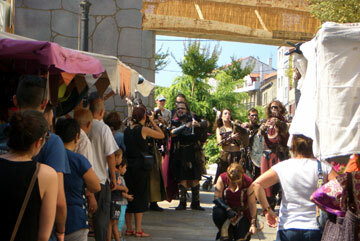 Medieval and Celtic festivals have become very popular in many Galician towns within the old districts or historic quarters. These fiestas and fairs take the form of a combination of stalls and street performers and see the town turned back in time by several hundred years. Typically, a number of streets in the historic quarter of the town are strewn with straw, all seats and benches replaced with straw bales, and the fronts of shops and businesses are decorated with hangings and tapestries as they would have been in the middle ages. Shop owners, waiters and even many locals adorn themselves in medieval dress and the town steps back in time to the medieval period. It may sound tacky, but in reality it is not and the genuine backdrop of medieval streets and buildings add to the atmosphere. This year (2014) there was a Celtic fair in Porto do Son in the last week of July. 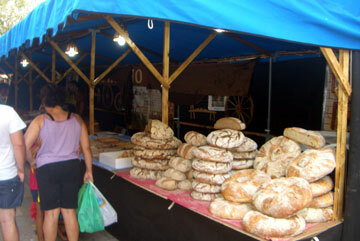 Many of the stall holders had been in Noia (a few km away) the previous week, so it appeared that Porto do Son was the next stop on their rota. As you can see from the photos, the stalls and their patrons were very colorful and the produce for sale varied from foodstuffs like bread, cheese, cured meats etc, to artisan and handcrafted ornaments and gifts. There were also some exhibits and displays. The stalls took up one main street plus a couple of smaller streets and the entrance was indicated by a makeshift stone arch. 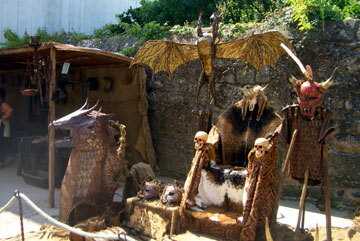 There is no entrance charge for any of the medieval and Celtic events in Galicia and you can wonder around them at will. In addition to the many stalls, these events also have street performers. Typically they are dressed as entertainers or warriors and they tend to have weapons, musical instruments or both. Whilst we were there we saw a collection of medieval warriors along with a performance by a magician. You will also find that some of the stalls have craftsmen-women making things as you watch. Prices can be variable, but then you are supporting the event and the travel costs of those involved. The Celtic fair at Porto do Son was on a smaller scale than the ones that I have seen at places like Noia and Betanzos, but these fairs and fiestas are normally worth a look. They tend to run for three or four days and are normally staged during July or August at the height of the holiday season. 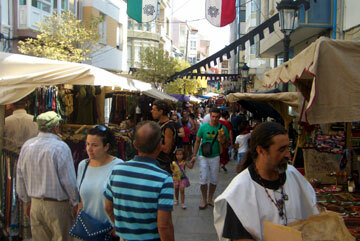 The Porto do Son fair was situated adjacent to the port and the regular open air market. The Castro of Barona is made up of the ruins of an ancient Celtic hillfort. It is free to visit, but requires a bit of excersize. To find out more, hit the link. The Castro of Barona 2 Some history and detail about this monument of Galician history. Porto do Son fiestas Select the text to the left to find out about some of this principalities many festivals, fiestas and celebrations. These fiestas take place throughout the year, so there is a good chance that you can catch one, irrespective of when you visit this region. Porto Beaches A list of some of the popular beaches along the Porto do Son coast.